SUBMIT YOUR SCRIPT TO OUR FICTION PODCAST COMPETITION! Interested in broadening your audience even more? Submit your script to our brand new Fiction Podcast Competition. Judging criteria is based on story elements such as plot, structure, characters, dialogue and concept, while taking into consideration elements of storytelling that are unique to this purely acoustic medium. Learn more now! AFF’s Coverage Program provides a detailed, constructive evaluation of your script and at $105 for feature scripts and $85 for teleplays, it’s the best bang for your buck! Need some last minute advice before clicking SUBMIT? In partnership with the Academy Education and Nicholl Fellowships Programs, AFF presented “Finding Representation” on Saturday, March 17th, 2018 at the Linwood Dunn Theatre in Hollywood. This podcast includes highlights from the first panel discussion called “How to Find Representation” featuring Jelani Johnson (CAA), Kendrick Tan (Madhouse Entertainment), and Ryan Saul (APA) who share what they look for in scripts and new writers. At AFF, story comes first and foremost above all else. We fully acknowledge the hard work and passion you put into your script and, rest assured, your story is in good hands. Our team of readers are an integral part of the AFF family and their contribution over the past 25 years have helped launch the careers of many aspiring writers. All of our readers within the Screenplay Competition are recruited through referrals from individuals closely associated with AFF and undergo a rigorous screening process. Once approved, readers are given strict guidelines and closely monitored throughout the duration of their participation. All readers are required to provide constructive notes for each script which will later be made available to all entrants at no additional cost. Most importantly, they are also required to read each script in its entirety to give full consideration which each writer deserves. We care about our process and we care about your work. Austin Film Festival will provide reader comments to ALL entrants in the Screenplay & Teleplay Competition. For FREE! All of AFF’s readers are required to provide detailed, constructive notes for each script they review. Each entrant in the Screenplay & Teleplay Competition will receive “Reader Comments” which are a brief overall summary of their notes (about a paragraph in length). The Reader Comments are not comprehensive but will provide insight into the reader’s reaction to the script. In addition to receiving the Reader Comments, entrants advancing to the Second Round and above (traditionally the top 15-20%) will receive further comments from 2 – 3 different readers based on concept, plot, structure, characters, and dialogue. Stay tuned here for sponsor announcements! 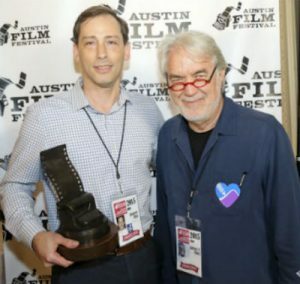 For over twenty-five years, Austin Film Festival has been catapulting writers into life-changing careers. With one of the most noteworthy competitions among Hollywood tastemakers, AFF consistently yanks newcomers from the isolation of their desks and ushers them into the bustling world of film and television. Whether your dream is to sign a contract, land an agent, learn from an industry icon, or take home the coveted Bronze Typewriter Award, it’s simple: you can’t win if you don’t enter. You know you want one. But, you can’t win if you don’t enter! Though AFF is one of the largest and most respected screenplay competitions, every entrant receives personalized attention and multiple reads throughout the process. AFF goes the extra mile to send both postal mail and e-mail notifications to ensure everyone knows their placement in the competition. All entrants receive FREE “Reader Comments” which are a brief, overall summary of their notes. As an added bonus, for Second Rounders (the top 15-20% in each category) and above, entrants receive further comments from 2-3 readers. Finally, Second Rounders may also find a personalized, handwritten note in their notification letter from the Screenplay Competition Director! Not only do all entrants receive registration discounts, but you get larger discounts when you place in the competition. Unlike other screenplay competitions, your experience with AFF doesn’t end after making the first cut. Second Rounders, Semifinalists, and Finalists attend exclusive panels, intimate roundtable discussions, script reading workshops, and are afforded special access to industry professionals. 2018 Second Rounders and above attended workshops about: how to find representation, demystifying the development process, and how successful alumni from the competition made the most of their placement. Additionally, a favorite event of entrants, Second Rounders and above were invited to the Screenwriters’ Happy Hour where they networked with other writers and competition judges. 2018 Semifinalists and Finalists had the opportunity to meet with agents, managers, and executives, and participate in our Script Reading Workshops where their scripts were read aloud and workshopped in a personalized setting during the Conference. Furthermore, Semifinalists and Finalists’ loglines and contact information are also included in the annual Producer’s Book, distributed to all AFF panelists as well as over 500 agents, managers, producers, and other industry professionals. At the Semifinalist level and above, judges—including professional writers and representatives from major studios and production companies—actively seek scripts and talent. In past years, these judges have included representatives from Seven Bucks Productions, Stage 13, Oasis Media Group, Mosaic Media, ABC Studios, Paradigm Agency, Di Bonaventura Pictures, Kopelson Entertainment, Nickelodeon, Escape Artists at Sony, Washington Square Arts, Fourth Floor Productions, Haven Entertainment, Artisan, CAA, Brant Rose Agency, WME, DreamWorks, and Pixar among others. AFF’s Screenplay Competition is one of the most acclaimed contests within the industry for establishing the careers of up-and-coming writers. It’s no surprise that past competition entrants have signed with major agencies and have had their scripts optioned, acquired, and produced by signatory production companies. 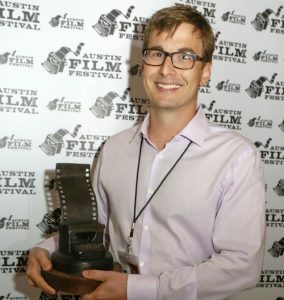 Henry Jones, 2016 winner of the Drama, Sci-Fi, and Enderby Awards, had his script acquired immediately after the Awards Luncheon; Wes Brown, 2014 winner of the AMC One-Hour Pilot Award, has staffed on the upcoming AMC television series Goliath; Troy Miller, the 2013 winner of the Horror Screenplay Award, had his winning script optioned by Frank Darabont’s Darkwoods Productions; at the 2014 Festival, AFF presented the world premiere of Dawn Patrol, a film produced from a 2008 Finalist script written by Rachel Long and Brian Pittman that was acquired by Enderby Entertainment during the Festival; and Amy Aniobi, 2011 Semifinalist, has been hired to write for HBO’s Silicon Valley. At AFF, when you win, you really win. 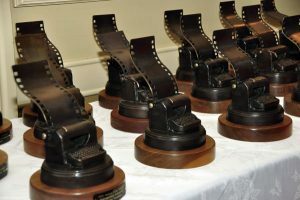 Not only is there a cash prize and our unmistakable typewriter statuette—five pounds of awesome you can carry around—but you win alongside legendary figures as part of our annual Awards ceremony. Last year, our winning filmmakers received their awards next to Norman Lear, John Singleton, Brian Helgeland, and Chris Cooper. It simply doesn’t get better than that. But wait, there’s more! Keep in mind that the Jury Award winners of our Narrative, Documentary and Animated Short categories officially qualify for an Academy Award®. Big things happen when you win our bronze typewriter, but you can’t win if you never enter. 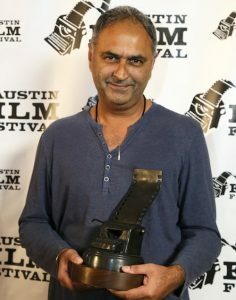 For general questions please contact the Script Competitions Director, Steven DeBose: steven@austinfilmfestival.com or by phone at 512-478-4795.